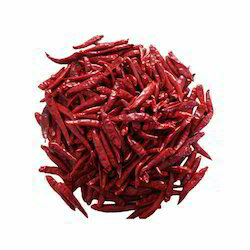 Whole Red ChilliesOur range of Red chillies is available with stem and without stem. These Red Chillies is procured from farmers, who adopt various modern and traditional methods in cultivating fresh range of chillies. Available in different pack sizes, our clients can avail these at market competitive prices. The Dry Chilly peppers are ready when they are close to brittle, breaking easily between your fingers. Dried peppers can be used as is in soups and stews but do need to be reconstituted to be used in other recipes. These can be easily preserved in the freeze and keeps the chili for longer time. We manufacture and supply dry chili to our customers at wide range. We are among the noted organizations of the industry by offering premium grade Hot Red Chili to our esteemed clients. These chilli’s are sourced from the best farms of India. Hot orangish red colour with an extra pungent flavour and strong aroma. We are highly acknowledged organization engaged in presenting a remarkable range of Dry Red Chilli. 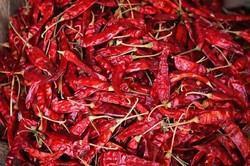 Matching up with the requirements of our clients, we are involved in offering Dry Red Chilli.